A few weeks ago Alexandra Tavel, from Two of Wands, posted about the Anti Bully campaign - Hat not Hate. "In this craftivist movement, makers are encouraged to create blue hats to wear proudly on World Bullying Prevention Day, October 1st, 2018 and share with the hashtag #HatNotHate to help raise awareness. Lion Brand is partnering with STOMP Out Bullying, the leading national anti-bullying and cyberbullying organization for kids and teens in the US and will be donating 2% of the proceeds of blue yarns during the campaign to the cause." I was drawn to her Peace hat design, only problem....I don't knit. Now I can knit a straight piece but anything else, it isn't happening. So I took the Graph Beanie Pattern, by Playin' Hooky and myself, and gave it a go. I am very happy with how it turned out and Cohen is now wanting one for himself. I used Lion Brand's Touch of Alpaca in Navy for the base of the hat, Wool-ease in Fisherman, Heartland in Black Canyon and Vanna's Choice in Taupe. For the next one I plan to use a lighter blue so everything will pop a little more. I am hoping to have a blue hat made for Cohen by October and help him understand the importance of being a friend to everyone. If you knit or crochet consider joining this movement and help Stomp Out Bullying. I hope you all have had a wonderful week this week. Ours has been busy. Cohen started the 2nd grade and Marlee is walking all over the place. Orders have been coming in for the new fringe earrings and the Pom Pom earrings continue to be a huge hit. Have you seen our beautiful new earrings in the shop? Let me start with the fringe earrings. These earrings are perfect with your favorite graphic t-shirt/t-shirt and jeans. They would look super cute for game day to match your teams color(s). They also look great on date night adding some fun texture and flair to your outfit. These are so light weight and come in many different metal options. These are all ready to ship, unless you pick the custom color option. If you pick the custom color option your earrings will ship within 10 days. Next up are the Pom Pom Earrings. These are also lightweight and perfect for adding some fun to your everyday outfit. Look how dressed up Meagan makes these earrings look in her LuLaRoe Dani and LuLaRoe Lindsay. They will be a fun statement piece with your favorite t-shirt and jeans. Or grab them in your teams colors. So dress these fun earrings up or dress them down, the choice is yours. Make sure you are following us on FB and Instagram, a little birdie said a giveaway is coming tonight. 6 years ago the Chicken Clutch was introduced to the shop and it quickly became a customer favorite. A few people have asked if I would bring it back, so for a limited time you can find the chicken clutch back in the shop. The chicken clutch looks best when she is filled with your treasures, keeping her nice and plump. After 6 years, we have made a few upgrades. The yarn itself has changed to a softer yarn, while also giving some yarn with great texture. Also we have included a magnetic closure vs. the button giving it an easier way to hold on your personal items secure. So now the question is...what color will your little Cluck Cluck Clutch be? Check back later this week, my 3 year old nephew wants a chicken clutch. I have a few ideas, just need to see how they work up. WOW! It sure has been a while since I visited this little space. Running this little business while having a 7 year old and a baby has been a tough balance. I think I am finally starting to get my feet under me to add the blog back into the mix. So I thought I would share one of the most recent pieces I have designed. This little Frida is perfect to go with your favorite clutch in the shop or even add one to your favorite bag. She is also cute paired with a Pom Pom either as her body or behind her. I adored her so much and love the example that Frida has set for girls/women everywhere. So I wanted a way that my daughter could use her. She's to small to wear a necklace, so I made her into a pacifier clip. Marlee has been a huge fan of her pacifier clip, so much so I am thinking of other amazing women to add to the shop. I did receive a special order for a Frida lovey and a small Frida worry doll for a Nena & Co. purse. What famous women in history would you like to see added into the shop? Also, customs and loveys are available until June 1. So go check out the shop and contact me if you would like to set up a custom. I promise to visit this little space more regularly. Stay tuned for lots of new items and some fun things to come. To stay up to date make sure you are following us on Instagram, like us Facebook and sign up for our email list. This little space of mine has been sadly neglected. Fall/Winter 2016-2017 became my busiest year yet as a maker. From selling in two shops, online orders and finding out we were expecting a little one...the blog took a backseat. I'm bound and determined to get back in the groove as I have so many new things to share with you. The turn around time in the shop will change for a short time as mid-July is when we are expecting Miss Marlee to make her appearance, I will share more on this soon. The shop will be gradually filled with a few new items and several may go away. You can find several RTS items in the shop or head into DNA Galleries in the Plaza District to get your Oikos Handmade fix. Stay tuned for some fun items...or to get some sneak peeks head on over and follow me on Instagram or Facebook. Yes, I am still around and hoping with school starting that I can give this creative space the attention it deserves. 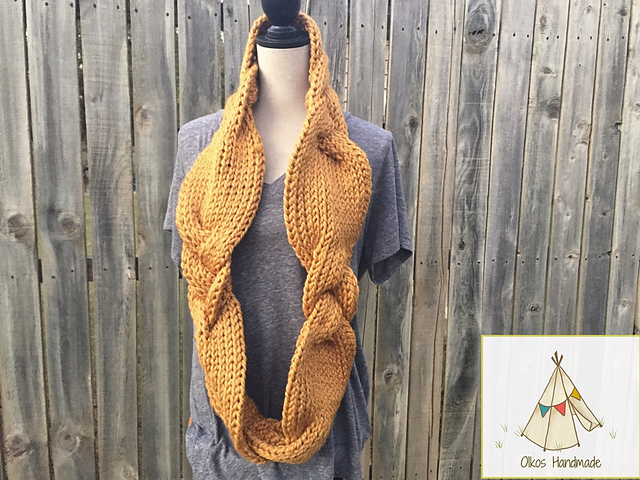 Fun and exciting things are coming to Oikos Handmade and it all begins with a new pattern release. Many of you asked for it last year but business and life got in the way of writing it down. With Cohen starting school I finally sat down to the computer and finished it up. 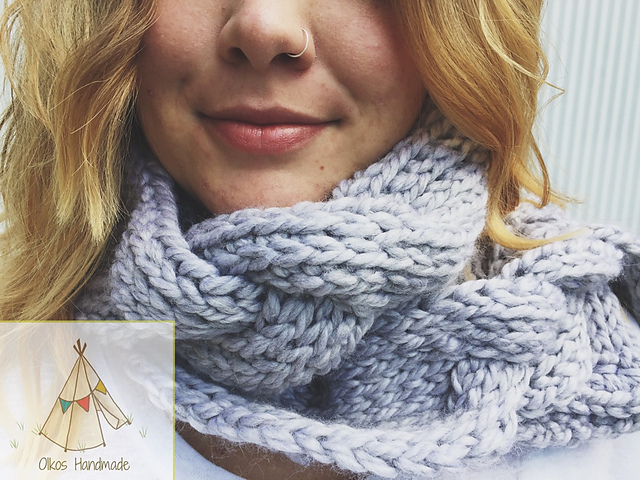 The Braided Infinity Scarf is a favorite piece of mine, so warm and cozy. It is made using Tunisian crochet making the fabric nice and thick. Don’t be scared of Tunisian crochet, it is so much fun and produces the most beautiful fabric. My friend Liz, with Playin’ Hooky Designs, just released some tutorials on her blog, check them out. This scarf is easy to adjust the length making it great for all ages. You can make it using one color, color block your scarf or use up those super bulky scraps you have stashed away for a rainy day. You can find this pattern over on Ravelry or over in my BigCartel Shop. From now until September 1, you can receive $1.00 off your pattern purchase, no coupon needed. Please share your finished project with me on Ravelry, FB or tag me on Instagram. Are you interested in ordering this scarf but don’t crochet? Don’t fret, I’ve got you covered. Until September 1, you can receive $10.00 off your purchase, for the Braided Infinity Scarf Only. Just enter coupon code: Braided10 at checkout to receive your discount. Enjoy and Happy Stitching my friends! Enter your email address to subscribe to this blog and receive notifications of new posts by email. Enjoy!